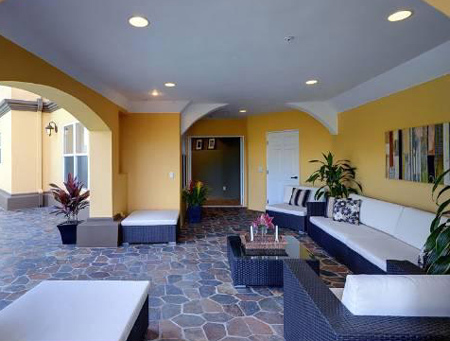 Choosing the right floor for your patio or entertainment area can be as difficult as selecting the right flooring for your home interior. 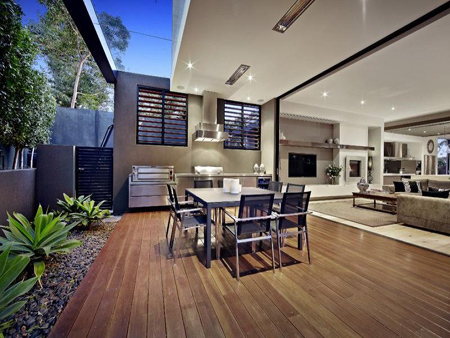 With any flooring choice their are pros and cons as to durability, maintenance, appearance and safety. 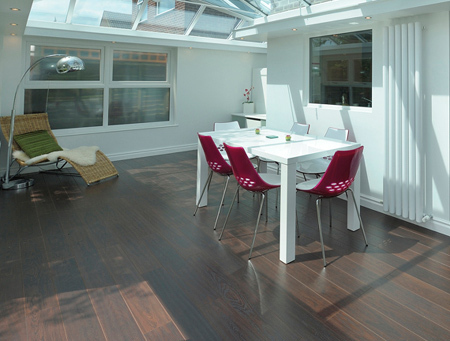 In this article we look at the various flooring options available and how each one offers benefits and disadvantages - helping you to make the right choice. 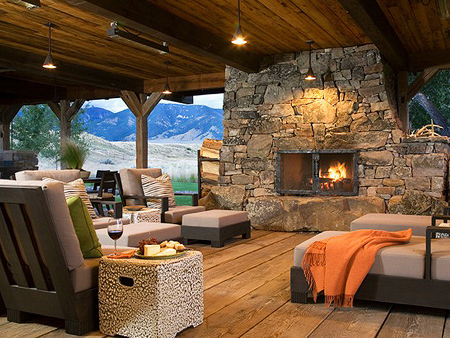 Natural stone tile or slasto is probably one of the most popular choices for a patio, dining or outdoor entertainment area. Natural stone and slasto are available in warm, rustic colours that can be combined with modern or more traditional design. 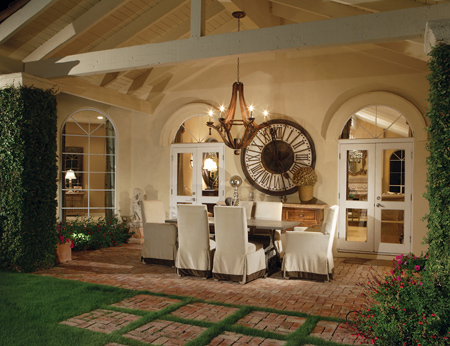 When laid properly and sealed regularly, slasto is one of the most affordable natural stone options for outdoors. However, it is important to use a matt or non-slip sealer for finishing, as these tiles can be slippy when wet, although not as slippery as other tile options. Natural terracotta tile is loved for its colour and texture. 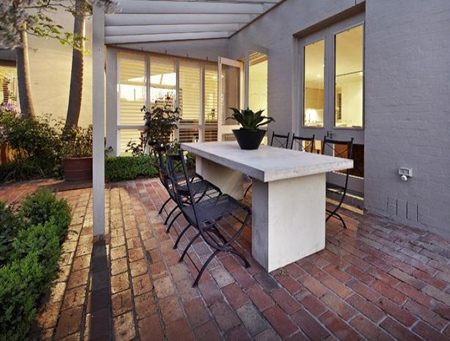 When sealed to protect the finish, terracotta tiles look good and add an element of warmth to an outdoor area. Again, treat with a matt or non-slip sealer. 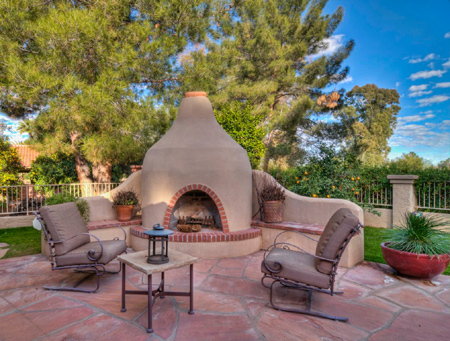 Other stone tile options for outdoor spaces include, granite and marble, sandstone, slate, travertine, etc. A glossy finish on these tiles is extremely slippery when wet, so look for options that best fit in with the location. 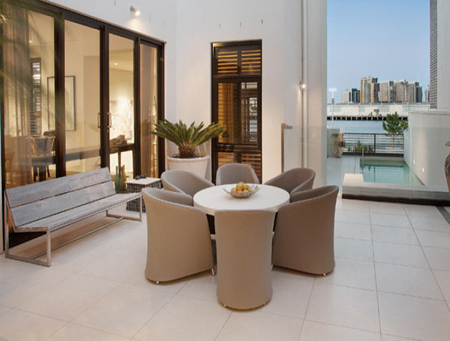 A rough-textured tile will obviously be a far safer option where an outdoor space is located in close proximity to a swimming pool or jacuzzi. Today, many homeowners are looking for greener or eco-friendly options for their home, and one material that will always be considered as green is clay brick. These tiles not only look warm, they are also warm underfoot. In the hot summer months when you have to hop around hot tiles, clay bricks stay cool. If you are considering clay bricks as a flooring option for a patio, outdoor dining or entertainment area, as with natural stone - apply a sealer to keep the bricks looking good and easy to clean. Re-using bricks or finding reclaimed bricks at a salvage yard offers you an opportunity to finish off a patio floor with a rustic touch that only aged bricks can provide. Lay solid reclaimed bricks in the centre portion and keep broken and half-bricks for filling in around the edges. 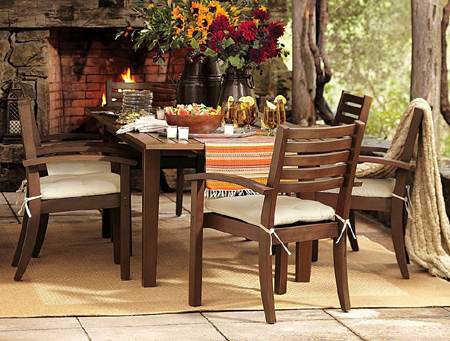 Reclaimed timber or hardwood floors are the most luxurious choice for outdoor living or dining areas, but unfortunately also the most expensive. While cost may be an inhibiting factor against the installation of this type of floor, bear in mind that reclaimed timber or hardwood floors offer unbeatable warmth and luxury underfoot. When regularly treated and maintained, these floors last a lifetime and will most definitely offer a return on your investment should you ever sell your home. Depending on whether or not these floors are exposed to the elements, or covered, will determine the type of maintenance that needs to be done on an annual basis. Some homeowners prefer to let these floors age naturally without the application of a protective finish, but for hardwood to stay looking good it needs nourishing, either with a wood preservative or sealer coat. Engineered laminate wood floors are not recommended for outdoor application, unless the space is protected from the elements. Another disadvantage of this type of floor in an outdoor setting, is that they tend to scratch, fade and frequent foot traffic will wear away the protective coating. Rather keep these floors indoors where they belong. 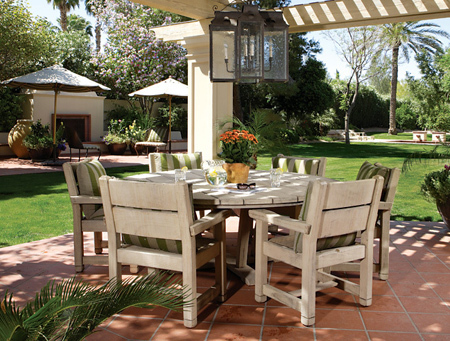 The most affordable and durable flooring option for patio, dining or entertainment areas is concrete. But not just any concrete... stamped concrete. Stamping moulds are designed in a selection of shapes, styles and textures to custom design concrete floors in a wide variety of patterns, and added pigments are used to colour concrete in a myriad of colour options. 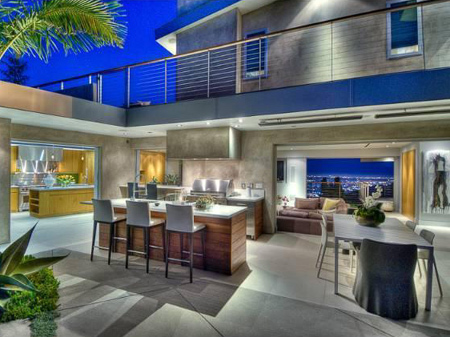 Every homeowner knows that concrete is one of the most versatile and hardwearing materials to use in home construction, so it makes sense that concrete flooring is just as tough. If you are looking for an affordable flooring option for outdoors, sealed, polished, stamped or acid stained concrete might be just the right thing, whether you do-it-yourself or have a contractor do it for you. 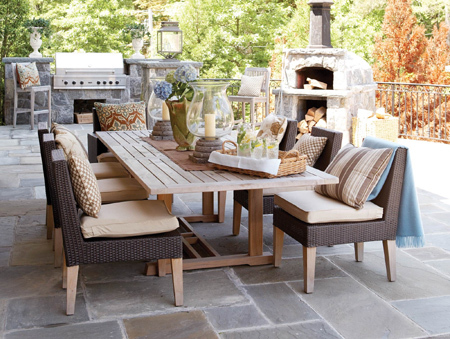 Whatever flooring you choose for a patio, dining or entertainment area, remember that dressing up these spaces is just as important as your indoor areas. Add an area rug - not only to protect the flooring, but also offer additional warmth and comfort underfoot. 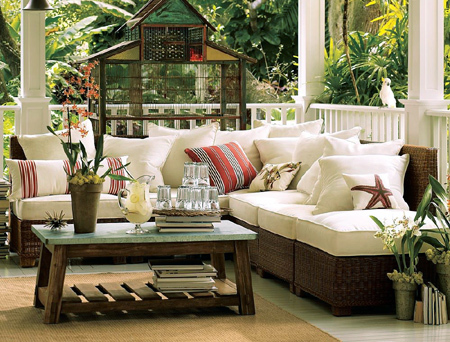 Natural materials such as coir, sisal and seagrass are excellent for a patio, and they are easy to keep clean and durable.